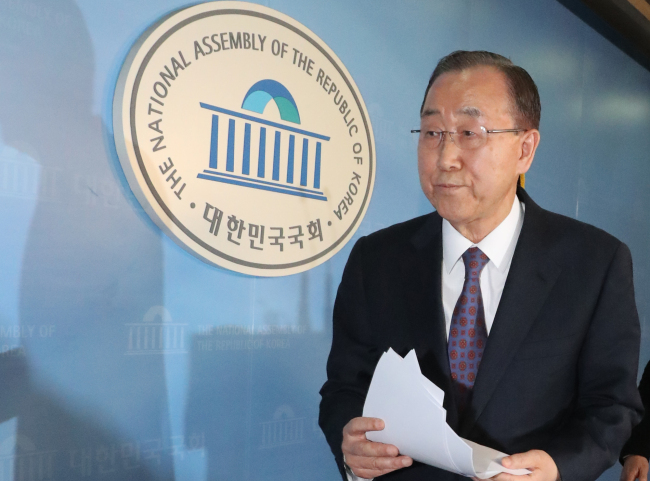 Former UN Secretary-General Ban Ki-moon on Wednesday renounced his much-anticipated bid in this year’s presidential election, a move which is likely to jolt the campaign road map. “I will give up on the pure intention to achieve a change in politics and to unite the nation,” the former top diplomat said in an urgent press conference held at the National Assembly. His announcement came as a surprise as the former top UN official has long been counted as one of the top-tier presidential aspirants, especially for the conservative camp. “It is myself whom I blame the most,” Ban said, asking for people‘s understanding and forgiveness. Since returning back to his home country earlier this month, Ban has been pacing across the nation to meet with people, in what was seen as a preparatory step for his presidential campaign. But with the ruling conservative Saenuri Party split in half in the wake of President Park Geun-hye’s impeachment, he has so far remained in the outskirts of political circles, with no affiliation to a specific party. Just ahead of his press conference, Ban met with party leaders of the Saenuri and the recently formed conservative Bareun Party. During the two separate meetings, he stressed the importance of reforming the nation‘s Constitution, raising the speculations that his announcement of candidacy was just around the corner. Ban had proposed a day earlier to form a consultative body to fuel constitutional reform before this year’s earlier-than-expected presidential election. As the law revision is deemed a crucial political agenda in the presidential election, this was taken as another gesture that he would make the anticipated bid. Prominent liberal candidate Moon Jae-in of the main opposition Democratic Party of Korea agrees that the revision is necessary, but claimed that it should take place after the imminent election. Altering the nation’s basic law, which has remained unchanged since 1987, has long been a subject of discussion. A key issue is to change the current presidential system of five-year single-term presidency to a double-term, four-year one. 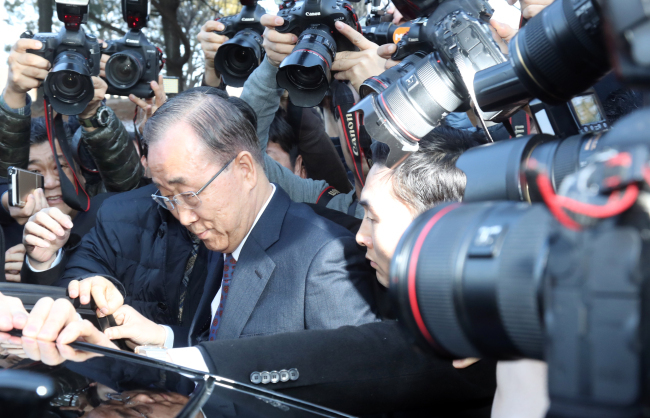 The Bareun Party, a Saenuri splinter which has been seeking to recruit Ban as a presidential frontrunner, decided to move ahead with its election plans without Ban. “There will be no change in primary rules or election roadmaps, whether or not Ban decides to join our party,” said party chairman Rep. Choung Byoung-gug, after his meeting with Ban. Ban’s sudden renunciation seems to be reflecting the recent fall in his approval ratings, as well as his vague position in between political parties. According to a poll conducted by Research & Research earlier this week, Ban's figures stood at 13.1 percent, lagging far behind that of Moon, who had 32.8 percent of the respondents’ support.